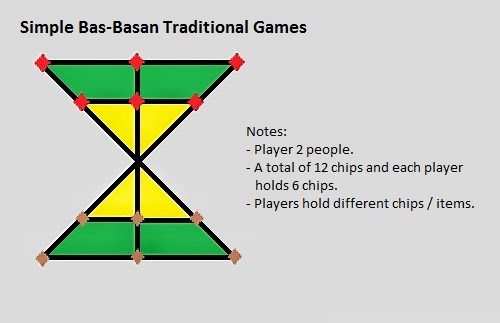 Bas-Basan is one of the world of game strategy epic-traditional of Yogyakarta that follows the pattern of the drawing area, and a game that follows the lines of a box laid out with a chip or media. They use simple media, such as: gravel, seeds, leaf, pieces of paper and so on. While the chip of seeds in this game they usually use seeds Melinjo (seeds of the Tropical tree), Kentos (Salak fruit seeds) or fruit that is not useful in the yard area. 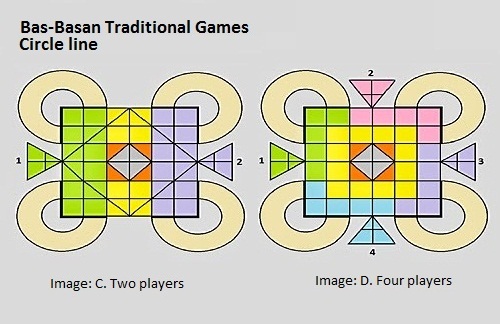 More interestingly this Bas-Basan game is also known by the names: Candy skin game (Permainan Kulit Permen), diamond game, rhombus game and box game. Pictures and arena of interesting game of course this game becomes one of the options to meet face to face among them. If travelers want to adventure in playing Bas-Basan game, hopefully this page becomes a guide Bas-Basan Game. In addition, travelers need to know about this game, and at least there is the first discussion in this game, for example: type or line model of Bas-Basan game. Bas-Basan game is one strategy game that has many methods or how to work in play. The Bas-Basan game strategy has certain criteria, so this game depends on: the number of players, the game method and the specific rules they set in the Bas-Basan game. They can choose a strategy game type A, B, C, D and simple Bas-Basan game. Usually they can determine their time at rest on the page to play, of course they have set the time for the type of game they use during break time. To know more about this game, let's discuss and explore the traditional epic Bas-Basan game. In view of this picture, surely you are also interested in this game. This is a very fun game that is played when in school that has a lot of free time to rest. This game is one of their most popular epic game options like Engkling, Mul-mulan, Benthik, Dakon and other interesting epic traditional games. So when it breaks in the yard, they form a separate small group to enliven the school yard atmosphere with a variety of traditional-games of the area. A long time ago, pattern images in this game is simply drawn on the surface of the soil as a medium, and today already can be made with a wooden board, paper, plastics and other material. For those who calm the atmosphere and special concentration or joke with close colleagues at the table. These type of area games are also interesting to entertain them. At this time the game Bas-Basan given different colors and attractive, but that with the different staining will be slightly outwit this game. So players are more careful to move. (Image: A) is 2 player, while the number of chip used 16 pieces in each of the player. 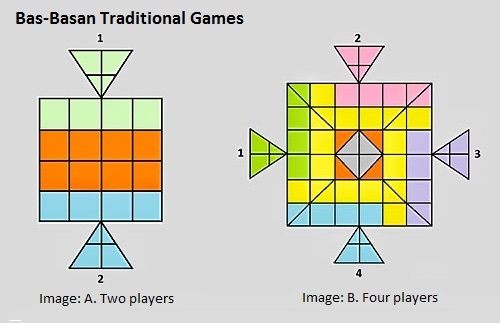 (Image: B) is 4 players, the amount of chip used (Image: B) is equal to the number of 16 pieces (Image: A) in each of the player. (Image: C) is 2 player, the amount of chip can wear 27 pieces in each of the player. (Image: D) is 4 players, with a medium amount of 16 pieces in each of the player. While laying chip (Image: A, B, C and D) are in a meeting lines and not in the middle of the line box. (See Image: E). How to move the game Bas-Basan? 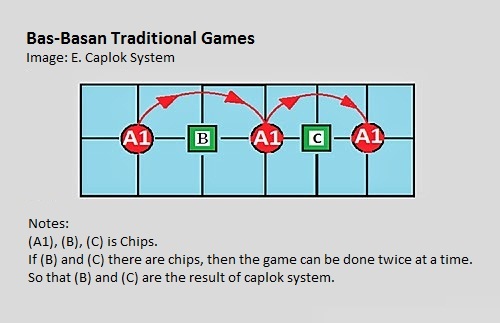 This Games is easy enough is namely to taking chips opponent with certain provisions or Java language often referred "Caplok-Caplokan or Caplok System", but there is also a called "Jumping System" at the point of the opponent chip. View (Image: E). The Caplok system in Bas-Basan game is at least as in the picture. Enjoy your trip for this game. Image Reference: Image: E - "Mencaplok" or "Caplok System"
"Mencaplok" or "Caplok System" is there are 2 kinds of ways: View (Image: E). Caplok System only once. (A1) occurs if there is (B) opponent. Double Caplok System. (A1) occurs when there is (B) and (C) the opponent, and so on. Because there is quite a bit of rest time at school, they often play only patterns (Image: A). While (type games B, C and D) take a very long time. In section (Image: C and D) is Bas-Basan using circumference line, only the difference (Image: C) assisted with diamond line or rhombus line, so that the chip can move askew. You can delete this line. Game (Image: B, C and D) quite a bit complicated and rarely played the children. Also must have prudence and particular attention so that when running the chip isn't taken opponent. To perform step to step (caplok-caplokan or caplok System) circle and angle of the line system; only allowed if the opponent is on the line thickness. Views (Image: C and D) or (Image: F and G). Epic travelers can also find this game which is almost the same in the Mul-mulan Traditional Game Yogyakarta. Read also in Exploring the Post Reference: (Mul-mulan Traditional Games) opens in new window. How to move the game Bas-Basan the the circle line? 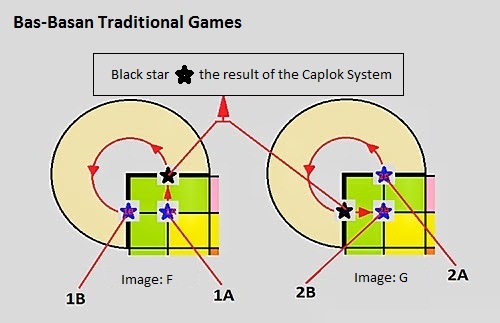 (Image: F) 1A star, black star "Caplok System" and became a star playing 1B. And (Image: G) blue star 2A, rotate and "Caplok System" got the black star became star 2B. This can be done (back and forth). And this game can also forward and backward to avoid the opponent's move. If the chip stay a little between 4 grains, then this game is allowed to stage a "Chip Crazy Game". Chip Crazy game in the Bas-Basan is when the road is free to stop wherever the place to get the opponent chip. Playing on "Chip Crazy Game of Bas-Basan" is also allowed through the perimeter of the circles to circles. It also depends on the pattern of the game Bas-Basan that used. Travelers can also set their own chip limit to follow this game. If player take of 1, 2, 3 or 4 chips remaining objects, for example (Image: C and D). Then the player must do "Chip Crazy" or change the way the chip freely without making rules at the beginning of the game. This goal is to immediately take the winner in this game. When first starting this game, the chip can only step through each point is determined and "Caplok System" or "Jumping System" when getting the opponent chip. The player has started "chip search crazy" or chip objects a little to chase opponent chips, then it be done stepping 3, 4, 5, 6 point line once running (on point line chip). Players aren't allowed to move chips on slashes in a single step in a different line. Unless there is a meeting of circumference line. The player can move in a straight line and stop at the boundary line. Players can move in a straight line on the game pattern and stop at the boundary line. Players can move through each circle line, and try to find the opposing chip. And the player can specify (stop) at the point of the chip he chooses anywhere or in the rules of the area line. If it gets the opponent chip, then the chip stops at the point it gets the chip and can't be resumed to take the opponent chip. So "Double Caplok System" doesn't apply to this session. There is no chip to "bounce system" on the game, for example: type (L) motion, zigzag for (Image: A, B, C, D or pattern "Bas-Basan Game Simple" as below) in a different line in a single step. Will it finish so soon for a victory in the Bas-Basan game on "Chip Crazy Games"? Of course it's not that easy. This will certainly require a long process to your victory or stop playing and no victory between Bas-Basan players. This is a much simpler Bas-Basan pattern. This is the beginning of the first Bas-Basan pattern created by children in the School, and then evolved into several patterns such as the examples of the images above. This games can only be done by two people only. The number of chips with a total of 12 chips and each player holding 6 chips. How to play this games the same as above. This games isn't much time, so this pattern is also one of the interesting games that are played when resting in the yard. Bas-Basan Traditional Games is a games that was originally a pattern, or a very simple games line. This games is often done by children at rest, this games is also a game to eliminate boredom. Other than that is one of their means of entertainment. So in this games they make more variations or patterns or games methods developed according to their tastes / preferences to eliminate boredom. The rules in this games they also make when Bas-Basan is being done at that time, so the rules in this games will be forwarded when the games is in progress at that time and until finished. OK ... Friends, this is ancient games reviews, the most unique games and have a lot of patterns or methods different games. This games is one of the most creative children's games we review on this page. Discover the best variety of games in "Epic Travelers - Play Games Traditional Yogyakarta, opens in new window. Greetings for explorers. The information you provide on this form will not be used for anything other than sending comments to your friends. Read more. When you have an account, you can express your opinion or comment. This feature will not be used for advertising, or excessive self-promotion. The information you provide by participating in any comment function, We will treat that information as part of a public figure. If you have any questions, please visit the HelpSite; I hope this helps. The greet to explore.